Hyannis Sportfishing: Family Friendly Charters! Predatuna Sportfishing has been providing its customers with some of the best Hyannis sportfishing charters Cape Cod and it’s offshore waters has to offer for over twelve years. Whether you want to catch jumbo Porgies and Sea Bass in the spring and fall, Striped Bass and Bluefish in the summer, or Codfish in the early and late winter, Predatuna Cape Cod Fishing Charters ensures that your time on the water is maximized. Looking for the ultimate Cape Cod charter sportfishing experience? Head offshore and catch Bluefin Tuna or travel to the Canyons and catch Yellowfin Tuna, Swordfish, Marlin, Wahoo and more aboard the Predatuna II, a 35′ JC Sportfisher. Our boat has twin 318 Horsepower turbo-charged diesel engines and cruises at 23 knots ensuring that you will get to the fish faster. Equipped with running water, toilet, microwave, toaster oven, fully stocked refrigerator, and very comfortable bunks, the Predatuna II is the best fishing charter Cape Cod has to offer. With over twenty years of sportfishing experience, Captain Dennis Chaprales, nephew of the famous Chatham Shark Hunter Billy Chaprales, has thousands of hours logged on Nantucket Sound, the waters east of Cape Cod, and down the entire east coast. 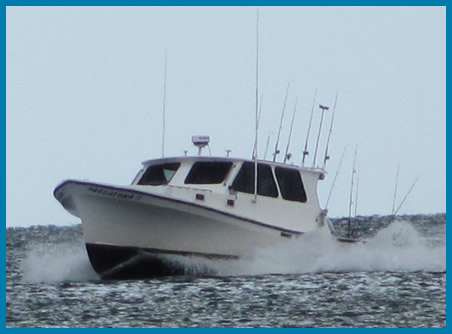 His extensive knowledge of Cape Cod charter fishing in the waters surrounding Cape Cod benefits his abilities as a charter boat captain and ensures that you will catch more fish!